It turned out to be a short night. At 4 in the morning of January 9, we feel the boat rocking on the ground. Steve decides to leave and we sail out of Panama well before sun rise. The ocean awaits us with big swells and a fresh breeze of 20 knots. 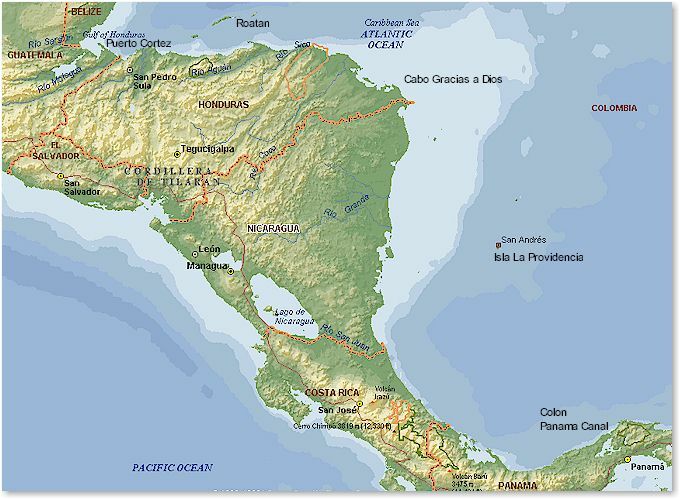 The island of La Providencia (N15.23, W081.09) is 250 miles away - we should reach it in a two to three day sail. Steve turns out to not only be an excellent cook but also a very good teacher. I use the first days to understand what all the million lines on his racing ship are for (all running aft to the cockpit for single handing). We also engage into discussions on the fine trim of his sails and I find out how a ship can be steered by adjusting the main sail (and not the rudder!). The wind comes from the North-East, requiring us to steer a close reach with heavy leaning to port. Unfortunately, the auto pilot decided to quit. Steve engages “Moni”, his wind-vane. Whereas the auto pilot steers a fixed magnetic course, “Moni” is able to steer by wind direction - always aiming for the best angel and changing course as required by shifting wind conditions. The heavier the wind the better she steers. We are aiming for 340 degrees, roughly North-West. As we get closer to the island it becomes clear that we would have to slow down to approach it at day light. Steve is still in 'Voyager-Mood' ("Don't get caught in the slow cruising live") and decides to bypass the island altogether to head straight for Isla Cozumel at the Yucatan Channel. Later at night we see La Providencia floating by on the GPS and on the radar as we head North. The next day is clear and sunny. 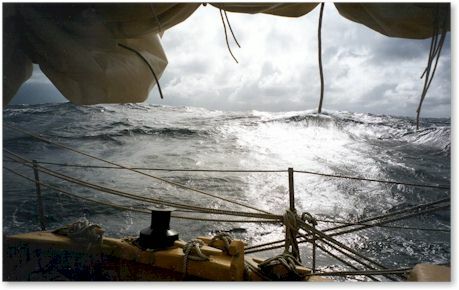 The sea has flattened a bit, making it a more comfortable ride, and 'Solitaire' steams ahead with 8 knots. We shake out the reefs and enjoy a relaxing day of gliding across the Caribbean Sea. 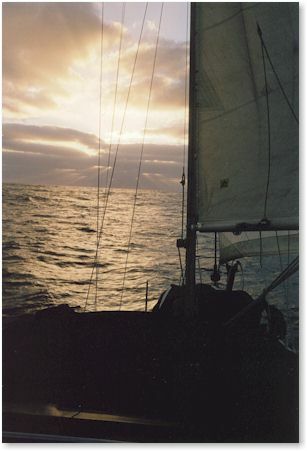 I have the feeling of being on a great ship and a wonderful voyage: The romantic side of open ocean sailing. Early the next morning the wind picks up again. 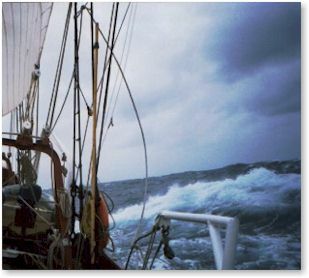 We are both on deck, being soaked by rain squalls, while shortening sails ("Reef early and often!"). As the wind speed approaches 35 knots, Steve decides to roll up the Genoa and replace it with a storm jib, mounted on an additional forestay. Meanwhile, the seas are re-building and 'Solitaire' is being lifted by 10 to 12 feet (3 to 4 m) waves before crashing down into the valleys between them. Before the sun is rising, we are in the middle of a storm of force 8 with wind speeds up to 40 knots out of the North. Even though the ride is rough and bumpy, I still feel comfortable. 'Solitaire' is moving ahead well, and Steve makes a very capable impression. Things seem to be well under control. We go down below to get out of our wet clothes and have breakfast. The cabin seems to be a safe heaven from all the chaos outside. We are leaning to port and are being pushed up and down the swell, but the inner boat is dry and feels comfortable. Just the laud BANG from the boat crashing down into the sea again and again pulls on our nerves. A look outside shows a bright and sunny day. The seas are high and crystal green. We see white caps all over and salty spray is flying through the air. Things are going smoothly with the only concern that the wind is pushing us farther to the East than we intended to be. This is not only closer to a lee shore (when caught between a shore and a storm you have no way of escaping when things get rough) but also an area full of reefs. Yet, the shore is still 40 miles away and the reefs on our map are far enough apart for us to be able to steer clear of them. In the afternoon, the storm is still blowing, but things seem to calm down a bit. We see fishing boats and when checking the whether on the Single Side Band short wave radio presented by Herb, it sounds like this Norther will not last for too much longer.